As an ice cream aficionado, broccoli ice cream sounds like a challenge I am willing to take on. Granville has to do just that as his veggie obsessed family attempt to trick him into loving green things more than jellies and cakes. However, Granville has a counter plan of his own. 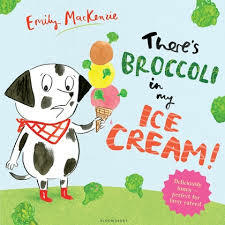 Chock-full of colour and flavoursome narrative – and some odd-sounding ice cream varieties – this is a sweet story perfect to whet the appetites of foodies and fussy eaters from four years of age. This absurdly colourful story is a recipe for laughs. 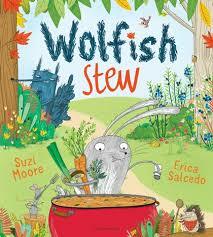 Similar in style to the Gruffalo, it is the story of a rabbit named, Grey and his nemesis, a wolf named, Blue. Blue is determined to track Grey to the ends of the forest and turn him into a wolfish stew but unwittingly ends up in the pot instead after Grey turns the tables and tricks him. Sure to tickle the tastebuds of fairy tale loving pre-schoolers. 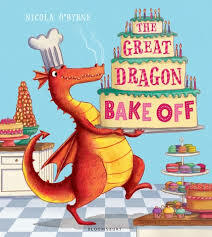 A picture book filled to bursting with pastries, princesses and fire-breathing dragons; it’s almost too much to fit in one mouthful. But try you must if for nothing else than the hilarious tongue-in cheek characterisation (the main character is a dragon called, Flamie Oliver) and rib-tickling cameo appearances by the likes of Heston Blowitall and Scaly Berry. Flamie ultimately fails his Dastardly Dragon Skills degree but ends up excelling in the Brilliant Baking Academy after listening to his true inner calling…to be a patissier. This is one for budding mini-master chefs who yearn to follow their dreams in spite of the expectations of others. We all know a family fun-day-out can be a tad stressful at the best of times. Best friends, Squirrel and Mole attempt to spend the perfect day picnicking together but things go a little awry after easing-going Mole’s picnic bag springs a leak. As he and detail-obsessed Squirrel trundle around the countryside in search of the perfect picnic spot, their victuals slowly disappear, however, through determination and kindness, friends rally to make their not so perfect day, the most fun ever. 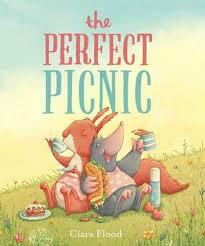 The Perfect Picnic will fill up hungry little minds three and over with the perfect mix of cute and joy. This is a glorious celebration of childhood and the dandy desire to dress up. Annabelle Mae and her girlfriends don frills, ribbons and feathers one afternoon for a spot of culture, tea and cupcakes. Little do they realise that the devilish boys next door are spoiling to kibosh their posh party. When they do, the result is unexpected muddy mayhem. 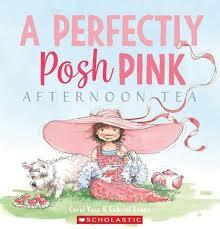 Evans’ detailed illustrations depict all the flounce and frippery of an elegant afternoon tea with grace and charm while Vass’ gay rhyming verse nimbly transports readers through this comical social calamity. Yummy fun for three year-olds and above. Remember Flamie Oliver – the dragon? Well meet Will, the pirate boy whose soul ambition is to leave the seven seas and run his own restaurant. Will is a whizz in the galley, knocking out his favourite recipe, cupcakes, by the barrel-load, but his pirate captain mum thinks he should focus on honing his swashbuckling skills instead of baking treats. When the fearsome Kraken attacks their pirate ship, Will inadvertently saves the day with a single…cupcake and instantly becomes the world’s worst pirate who makes the world’s best cupcakes. 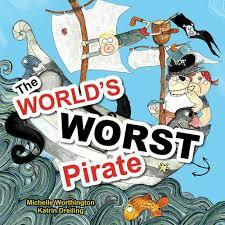 Rollicking narrative and outrageously animated illustrations fill this story with delicious quirk and humour. Full marks. Treasure it with little swashbucklers from three years plus. 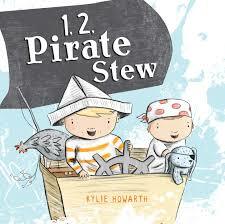 Pirate Stew is the pirate version of popular nursery rhyme, One, Two Buckle my Shoe. It flows playfully along the imaginative seas of two young boys as they hunt sea monsters, become marooned and eventually make it safely back to harbour in time for tea – or stew as it may be! 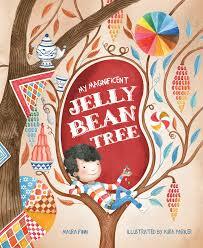 Thick sturdy pages and bright illustrations make this counting picture book worth hording. Perfect for little hands and minds, 18+ months. Beautifully presented in a cloth bound cover and divinely illustrated in hues of pastry pinks and yellows, The Sisters Saint-Claire is a culinary and cultural sojourn you must savour. Set around a French country market place, this is the tale of Cecile, who loves baking but is tired of being excluded from her family’s regular Sunday market expeditions. 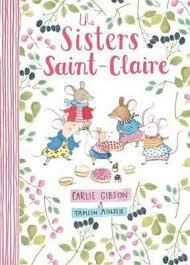 One day, her mother concedes that Cecile is no longer a baby mouse and she is allowed to accompany her four sisters to the market…with her gourmet pies. After a long and futile day behind the stall, a royal visitor turns Cecile’s fortunes around forever proving that from small beginnings, great things are possible. Gibson’s gently rhyming verse serenades this tale centred on family and devotion in a way that young followers of fashion, food and all things French will gobble up. Most appetising for 4 – 8-year-olds. If you are fond of picture books with sharp minimalistic edge, plenty of white space and humour that positively bounces off the page, then this one is for you. Anteater is sick and tired of his dietary obligation…to eat ants. Nevertheless, he is hungry so with the help of his imagination, he concocts a smorgasbord of ways to eat his ant. 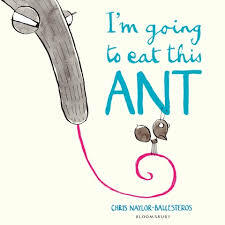 What follows is a scrumptious safari of alliterative delight and culinary delish, until suddenly, too late, Anteater realises he’s missed his meal altogether. This book works for me on so many levels. Grammatically it sings, visually it entrances. I loved it as much as a bowl-full of ants…no wait – more! It’s the perfect way to dish up different food types and cooking methods to youngsters that also serves as caution against playing with their food. Share it with fussy little eaters from the age of two.